Before I dive in, here's a heads up that I'm visiting Writers in the Storm today to chat about a fun way to get you out of a writing rut. Come on over and say hello! We spend a lot of time talking about what to cut from our manuscripts, but there are times when we really do need to add words. Even if a novel is the right size for the intended market and genre, we might feel the story just needs deepening to make it stronger. Here are some common reasons to add words to a manuscript. Since we know what everything in our novels mean, we don't always make it clear why a character is acting as they are, or what that world building detail really means. If you're unsure readers will get it, or if you're getting feedback that shows readers aren't picking up on something, it might be worth adding some words to clarify what you mean. One word of caution: Readers are sharp, so make sure what you feel is unclear really is unclear, and not just subtle. One of the most common places to overstate or repeat ourselves is when we explain, because we often feel like the reader won't get it unless we bash them over the head. Readers usually pick up a lot more than we expect them to (and see things we planned). Good beta readers are invaluable for checking clarity. Those outside eyeballs catch details we know way too well to see the uncertainty. Another good excuse for adding words is to control the pacing. While you never want the pace to drag, there are times when you need to slow it down and give your readers a little breather. Fleshing out some internalization, or allowing a character to take stock of their surroundings allows your reader to absorb what just happened and can even put more focus on the story elements you're taking your time with. Maybe there are good spots to elaborate on a key piece of information that needs a little infodumping to get across well. While adding words to pick up the pace might sound counter intuitive, the right words can help increase tension and move the story faster. Adding fast-paced dialog to a heavy descriptive passage can turn a slow scene into a quick scene. Usually, this is high on the list of places to cut, but sometimes adding a line or two here and there can deepen your world and story. The trick is to find examples that achieve multiple things. For example, a detail that not only describes the street, but shows the economic status that is causing your protagonist trouble, shows the obstacles in your protagonist's path, and shows a personal opinion from the protagonist. If the words you add do double duty, then you achieve a much more layered and complex world. Not only does it set the scene, it also helps show character, and can even create conflict and tension. Internalization is often lacking in early drafts, so it's another area that might need fleshing out. If the story is feeling distant or readers aren't connecting to the characters, that could be a red flag to get a little deeper in their heads. Try looking for ways to get inside a character's head to reinforce their goal, remind readers of the stakes, or show another side of the character that adds a layer of conflict. Maybe those thoughts hint at a dark secret or foreshadow a major set piece. Knowing what goes on in a character's head goes a long way to making readers care about that character. Sometimes adding words is what a novel needs, so don't be afraid to flesh out a scene or chapter. Unless you're revising specifically to cut words, the end word count probably won't change all that much, you'll likely cut as much as you add. I spent a week revising my second novel, Blue Fire, and my word count fluctuated by just three thousand words. I'd cut what wasn't working, add more to make it work, cut more, add more, wash, rinse, repeat. If you just looked at the word count, you'd think I hadn't done a thing, but it was a much better book in the end. The right words are more important overall than the number of them. How often do you add words? "You always pay more attention to a movie right after a big scare, right? Same idea." 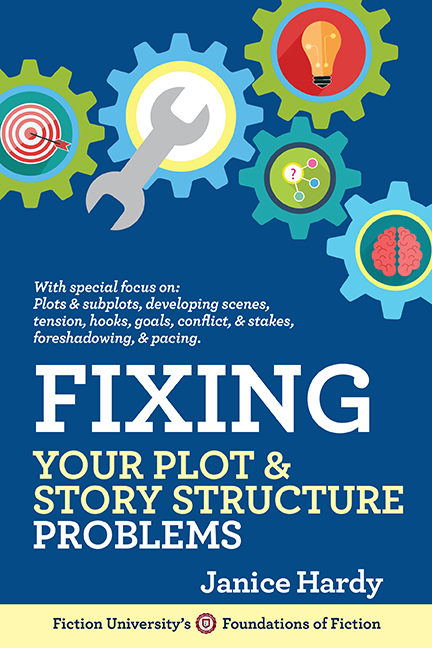 Re-Write topics...what about adding more characterization to a very plot-driven story? My last book has so many characters, I feel like some of them aren't popping on page as much as they are in my head. When you re-write, how do you flesh out some of those characters to get them just right in the final draft? Thanks! Good idea. I'll do that next week. I always find it easier to cut word count than to add to it. Generlaly though I don't worry too much when I'm editing until I'm at the very end and really need to add an extra 5,000 words. I'm one who always writes long, although I did have an editor request (and who denies an editor?) that a scene I had merely alluded to be shown on the page. It was an action/combat scene, and although I had originally said something like, "after a lifetime, which according to Dalton's watch was only seven minutes, the gunfire ceased" -- anyway, she said, "Please show those seven minutes." But normally, it's harder for me to add because I like to think my writing is tight and it's a chore to weave things in. From the hundreds of unpublished manuscripts I've read over the years, I'd say that internalization is more likely to be overdone than underdone. This is particularly true of romance. Excellent ideas, can definitely say I've followed a similar pattern. Although mine tend to be overstuffed to start with and I cut them down from there. Still some areas need refinement so words go in, but overall it's more emphasis on the cut than paste. The last is what often happens with me. I'll try the others too. I usually overwrite the intwrnalization and underwrite the worldbuilding. Or so that's what my betas say. Paul: I usually keep an close eye on my word count, but that's just because I use it to help me control my pacing. I'm a structure gal, so it's a tool for me. But because of that I usually hit my desired word count pretty closely. Or at least, now I do. I used to write way to long and always had to cut. Terry: I can see that. My editor has asked me for things and sometimes it's hard to know how to get them in there. I always run significantly short and have to add. One of the most important things to do is watch THE STORY not the word count. It's really easy to monitor the word count and add a few more to bump it up -- and that's usually how the junk gets into the story. Linda, wise words indeed. No matter what stage you're on, the story should always come first. Transitions. Transitions are the often-overlooked bane of clarity, as are character motivations. I'm the "write sparse" kind of writer. The more I write, the less I'm having to add in later passes, in general. There are some narrators and worlds that are exceptions, but even in that case… I tend to be heavy on the dialogue & PoV internalization/motivation, and needing to flush out the externals a bit more. That tends to be me on a first draft as well. Description is something I always have to add on the second draft. Another keeper, Janice. thanks to the links to previous blog posts too. Your blog is a university--for sure! Most welcome. Glad you like the links. There's so much here, I'm always looking for ways to make finding information easier.